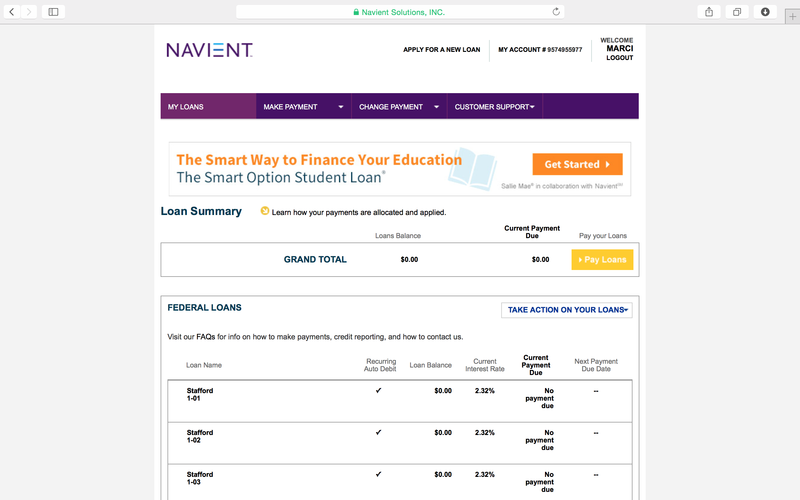 Today, I paid off my undergrad school loans! I’m out of debt!!! Considering that I am only 10 years out of undergrad and went to a pricey, selective, private institution, this is kind of a big deal. Alright, it is a HUGE deal! I also deferred for two years while I was in grad school, so to be able to pay them off in only eight years of full-time employment kind of blows me away. It also made me think about what had to happen for me to pay them off in less than a decade. Did it take discipline, hard work, and careful planning on my part? Of course. But there were so many other factors that made it possible. College Educated Parents: Both of my parents have their Bachelor’s degrees. My mom followed a traditional path going straight from high school, to college, to employment as a speech language pathologist in our local school district. My dad went to college as a non-traditional student. He worked for his family’s farming company after high school, then went to a community college and finished up with his Bachelor’s degree in Mechanical Engineering when I was just starting kindergarten. Since my parents lived for several years on my mom’s income alone (which was a teaching salary in the early 80s so she was bringing in less than $25,000/year for a family of four!) they were adamant about both my older brother and I going to college somewhere the gave excellent financial aid and required the least amount of personal debt. A Fortuitous Envelope: After I toured Witt, I was in love, but it was a wistful kind of love. I loved the professor I met, the students I talked to, the Admissions Counselor was incredible, and the campus was the most beautiful I had seen in my half-dozen visits to private colleges around Ohio. I say it was a wistful kind of love because Witt was also the most expensive choice of the places I had seen. 10 years ago the total bill was around $40,000/year, which seemed untenable. My mom drove me away from my visit and said, “Don’t fall in love, Marci. Everything depends on the financial aid.” A few months later, the tell-tale giant envelope came in the mail. My mom saw it was from Witt and nearly threw it away, as she was so convinced we couldn’t afford it! We opened it, saw the generous package and my mom said, “There must be a mistake. This can’t be right.” She was so convinced that there was another Marci Walton out there who received my Financial Aid package, bummed that she couldn’t afford Witt, that she called the Financial Aid office to confirm. It was true. I could afford my dream school! Employment Opportunities: My first year, I claimed my federal work study award. I worked mornings as the campus operator, so if you called Wittenberg University in the fall of 2001 or spring of 2002, you probably spoke to me! I also worked at the Phone-A-Thon, calling alumni as perspective donors. My sophomore though senior year, I was employed by Residence Life as a Resident Advisor and then Community Advisor. This provided free housing and a $1,500 per year stipend. During my summers, I always had a job. I worked as a telemarketer (truly hell on earth…one day I was told “no” 143 times in a row! ), camp counselor for high school students with severe mental and physical disabilities, and had the summer of my life on the Witt Conference Services team. I was privileged to be able to find work that helped to supplement my bill at Witt. I was privileged that my parents took the bill each semester, split it in half, and then out of my half came my grants, scholarships, loans, and supplemental income. All of this was under the auspices of keeping my loan amount as small as possible. Interest Rates and Knowing What those Were: During grad school, when my loans were in deferment, the government slashed interest rates. My brother and I both consolidated loans to an incredibly low 2.32%. We knew to do this because our parents told us to AND, in my case, because Witt sent communication to me post-graduation! I was privileged to have parents who knew the power of an interest rate and how much money that would add to payments over multiple years of payments. I was privileged to attend a university that cared about students’ financial health even after they were no longer students. A combination of my and my parents socioeconomic, educational, financial knowledge, and a variety of other privileges contributed to paying off these suckers. Being privileged to attend a private university that cared about how students were going to be able to afford the sticker shock also contributed. It didn’t just take me writing a check once a month. All of these privileges, along with a multitude of others, helped me graduate with HALF the amount of the average student who graduated with in 2005. The allowed me to follow my true career interests in education, which are notoriously low-paying jobs, instead of taking a job solely to keep up with my loan payments. It allowed me to have a traditional college experience so I could engage in extracurricular activities, not have to work multiple jobs, ship money home to my parents, or worry about food insecurity or where I could stay over the holiday breaks. I am eternally grateful and even more motivated to creating college environments that help to supplement the privileges that I utilized to finance my education. 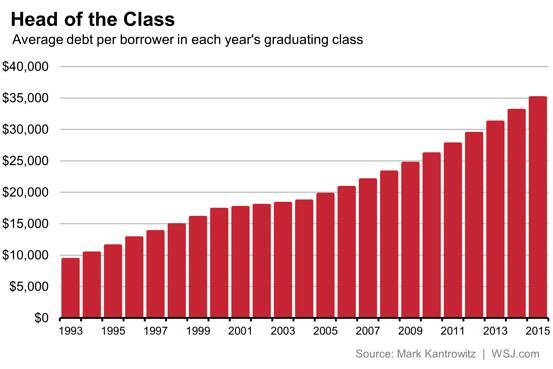 With student loan debt skyrocketing, what can YOU do for our students?